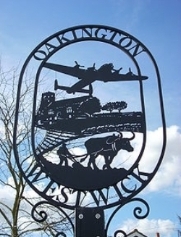 Oakington will always be the spiritual home of 7 Squadron yet the Squadron was based there only from October 1940 to July 1945 but being unique in Bomber Command having been based at the same station throughout its World War II operational career. Construction of Oakington began in the summer of 1939 - the site, some 5 miles north west of Cambridge, having been selected for an expansion scheme airfield. Operational use started in July 1940 when it was used for 218 Squadron (2 Group), which had recently returned from France, with the first offensive operation in August 1940. In September 1940 Oakington became part of 3 Group when it was chosen as the base for the first Stirling squadron - 7 Squadron. 218 Squadron left Oakington in November 1940 so that 7 Squadron could have more space. Then in November 1940 Spitfires of the recently formed 3 Photo Reconnaissance Unit arrived - however because of the poor surface during the winter months the Spitfires frequently used Alconbury. Oakington's grass surface was also the cause of problems for the heavy Stirlings during the winter of 1940/1941 - there were a number of landing and take-off accidents because of the strain put on its undercarriages. Oakington was first used by 7 Squadron for an offensive mission in February 1941 to attack Rotterdam docks. But because of the service Oakington was frequently unserviceable with the result that the Stirlings had to fly to Wyton to bomb-up for operations. In the spring of 1941 runway construction began - the main runway 05-23 and 1700 yards long was completed first with 01-19 (1300 yards) and 10-28 (1400 yards) completed over the next twelve months. 05-23 was subsequently lengthened to 2000 yards and 01-19 to 1530 yards. Subsequent building work included realigning the perimeter track and expanding the domestic accommodation to allow for nearly 2000 personnel. The Pathfinder Force, which 7 Squadron had joined in August 1942, became No. 8 Group in the January of 1943. Its policy was to have two Squadrons per airfield. At Oakington 7 Squadron, which was being re-equipped with Lancasters to replace the Stirling, was joined by 627 Squadron formed with the Mosquito. The latter Squadron moved to No. 5 Group in April 1944 being replaced by the newly formed 571 Squadron. With the end of the conflict 7 Squadron moved to Mepal, 571 to Warboys with Oakington now becoming part of Transport Command. During the summer of 1945 it was the base for 86 and 206 Squadrons flying ex-Coastal Command Liberators for long-range troop transport to the Far East. After these Squadrons were disbanded in April 1946 a series of other transport squadrons occupied Oakington. It was then taken over by Training Command towards the end of 1950. Eventually the Army took the station over as a barracks. The final regiment to occupy the camp was the Royal Anglian Regiment which moved out in 1999. The buildings are now used to house asylum seekers. The runways were removed for hard-core for the construction of the nearby M11 Motorway (although the perimeter track remains).